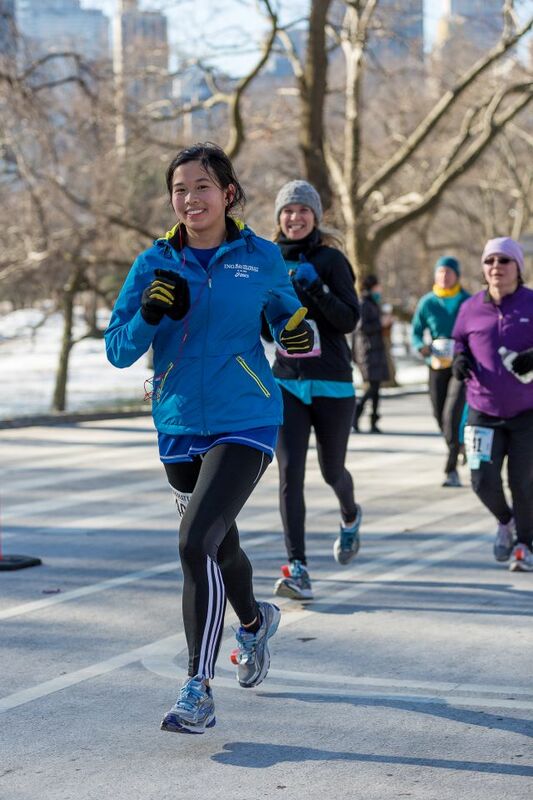 Grand Central Centennial, Lululemon Warehouse sale, Empire State Building Run-up preview & NYRR races! I had a jam-packed week from 2/1-2/6, filled with Super Bowl excitement, Lululemon Yogabowl Warehouse sale planning, two races, and Grand Central’s 100th birthday! 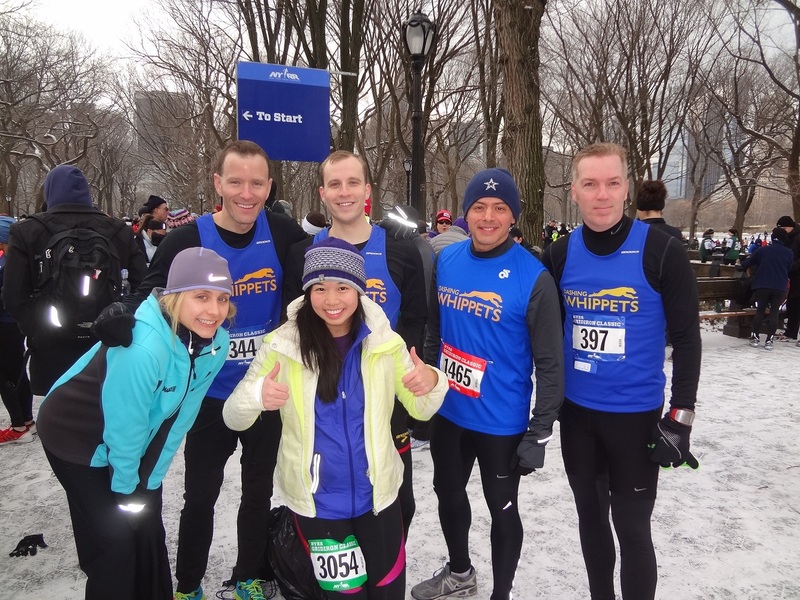 I had actually just run the NYRR Manhattan Half Marathon on Sunday, 1/27, and had barely recovered from the cold snap that we had for that race. 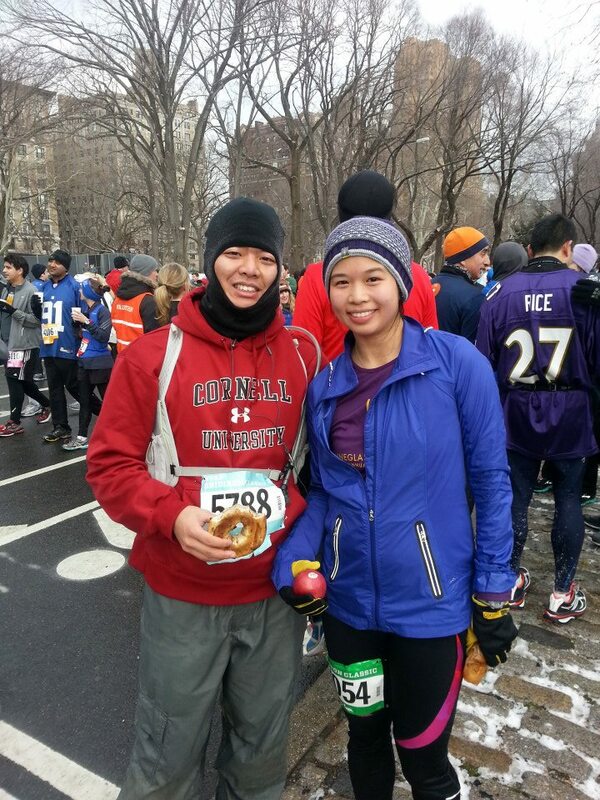 It was one of the coldest races I had ever run, 20F at the start and it only warmed up to 24F by the finish. I ran a 2:06:36 (9:40 min/mile pace), but I really wasn’t going for time because it took me all of 3 miles to warm up and feel my feet! 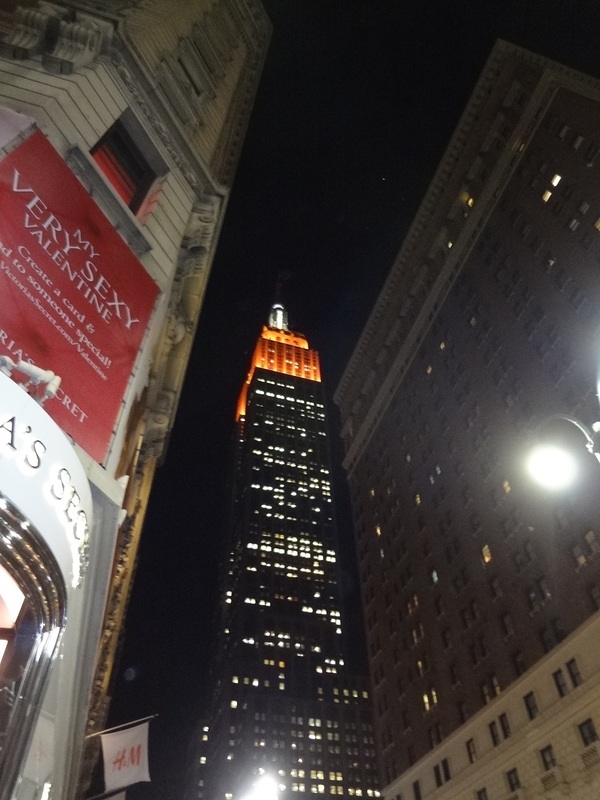 I decided to race smart and save my effort for the Gridiron Classic 4-miler and the Empire State Building Run-up the following week. Thanks so much to my friend Ben for taking photos, Jennie and others for cheering, and to all the volunteers who braved the cold! 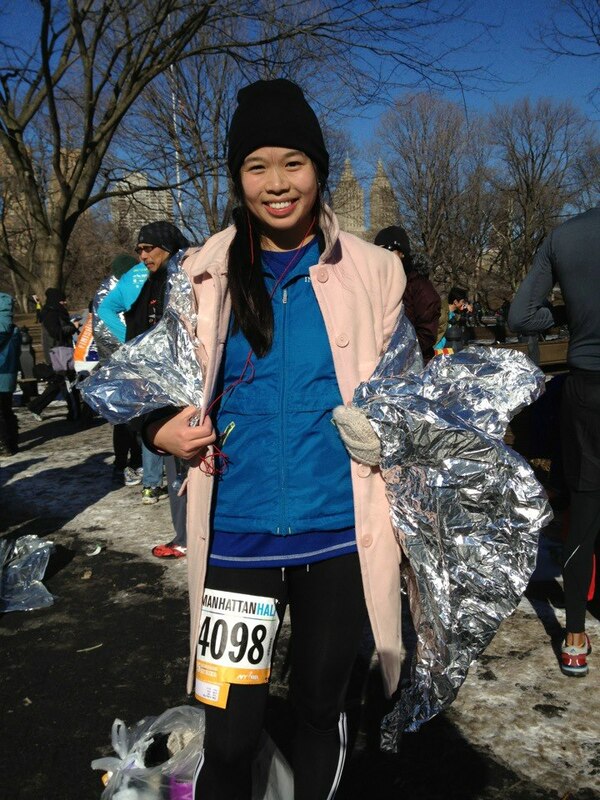 It was my first half-marathon of 2013, so I was happy with the effort. January for me is all about getting back into it after a bit of holiday indulgence. 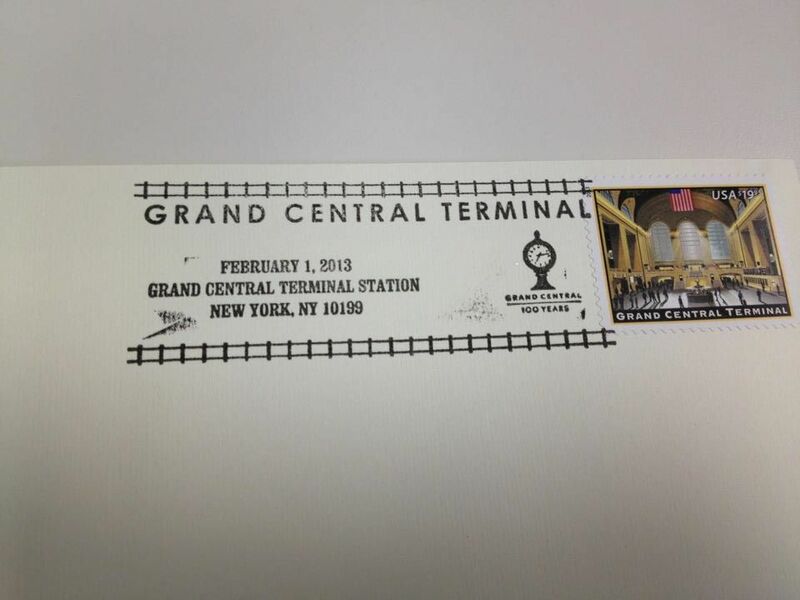 A few days later, on Friday, 2/1/13, was a New York milestone: Grand Central Terminal’s 100th birthday! 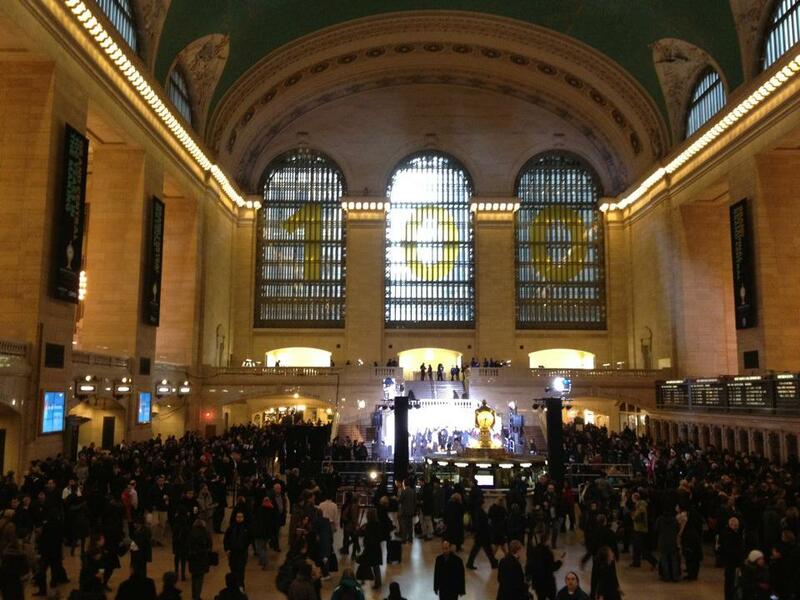 As a native New Yorker and someone who had been through Grand Central more than a few times, I was excited to partake in the celebration. There were giveaways, food samplings, and some merchants even “rolled back” to 1913 prices! I’m pretty good at finding deals and discounts in NYC, and this seemed like a gold mine of deals. Plus, I wanted to be there for the festive atmosphere. There was a big stage set up for a ceremony and celebrity guests like Cynthia Nixon and Mayor Bloomberg, but I didn’t stick around for that. 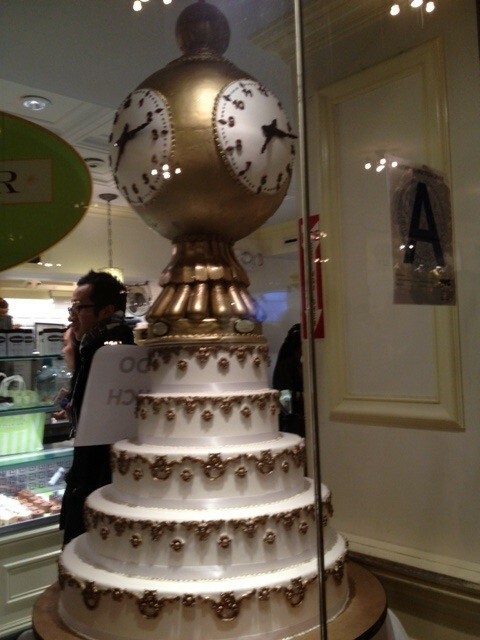 There were huge lines for some things like 5 cent coffee from Financier, so I steered clear of those. Other cool stuff that happened throughout the day included: USPS unveiling a limited-edition express mail Grand Central commemorative stamp, First Day of issue cancellations, the holiday train show, Guiness World Record presentation for “busiest terminal in the world,” a Lego model replica of GCT, and special merchandise at the NYC Transit Museum Store. Financier even created a beautiful cake to celebrate the centennial! I was actually most excited about the First Day of Issue cancellations for the postage stamp, since my mom is a philatelist (stamp collector) as a hobby, and I used to go to stamp shows as a kid. There was a huge line for this, but I buddied up with a stranger to minimize the wait time (he was in one line and I was in another). The First Day Covers are also collector’s items, and can be very valuable one day. For me, I’m just keeping it for sentimental reasons (for now). My best souvenir of the day–GCT 100 First Day of Issue cover! 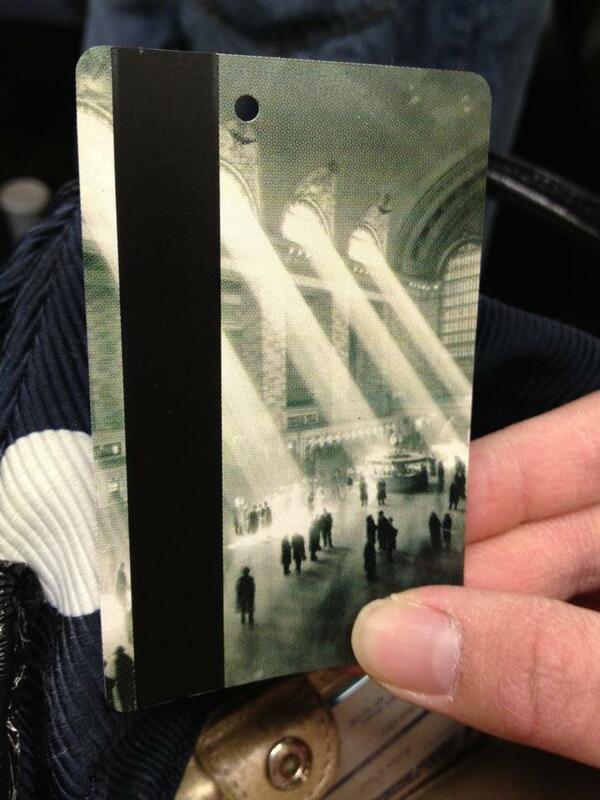 And, like a big geek, I got super excited when I realized that the MTA created special Grand Central Metrocards that were issued at the vending machines at Grand Central. 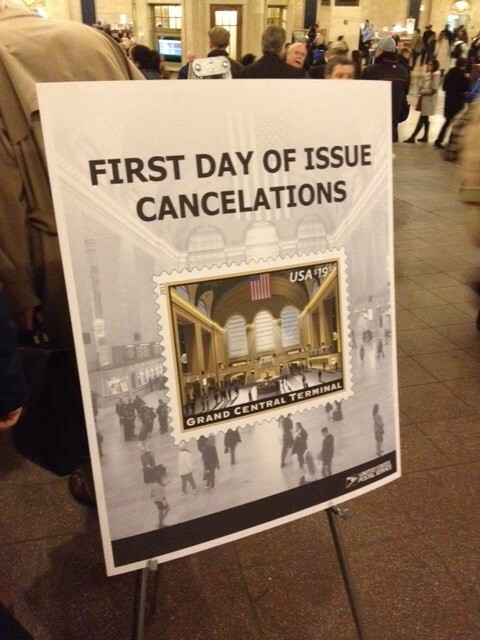 Perfect timing–I needed to buy a new monthly Metrocard anyway! 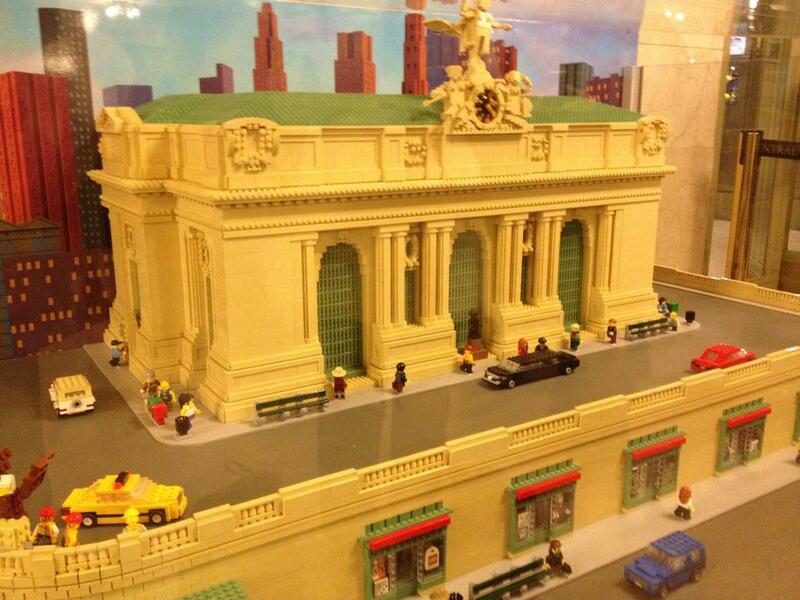 Happy 100th Birthday Grand Central! I am a pretty big fan of Lululemon athletic wear for running. I ran my 100-miler in Lululemon shorts, flew to Vancouver with my friend Amy for the inaugural Sea Wheeze Half Marathon (sponsored by Lululemon) in August 2012, and I pretty much buy their stuff on sale (usually only 20% off) if I reach a significant running milestone. 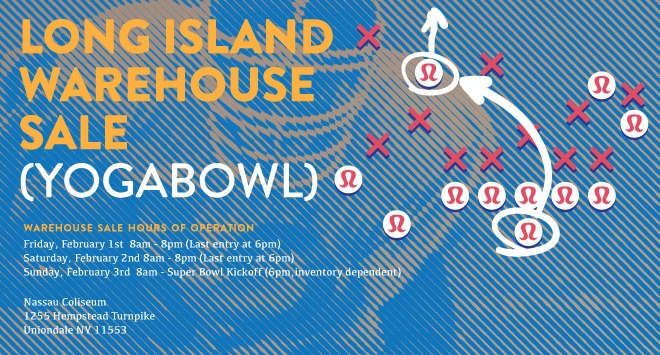 When I first heard about the Lululemon Warehouse Sale (Yogabowl), I knew I wanted in. Problem was, the sale was on Long Island and I don’t drive. Well, thanks to the magic of Facebook, I connected with four of my running friends who were also Lululemon fans, and we planned all week long to hit the sale on Saturday (the second day) to score some running gear at deep discounts. Lululemon stuff only goes on sale once in a blue moon, and only for overstock items. At best, you get 25-30% off, nothing more. I heard that each year since they started a warehouse sale, Lululemon only picks one US location and one Canadian location. Last year’s was Chicago, so this was an opportunity not to be missed! So Evelyn, Cipriana, Kristen, Mary and I piled into a rented car at 6:30am on Saturday, and drove from Brooklyn to Long Island. We had stopped at Bagelsmith in Brooklyn for breakfast, so that helped us feel more alert. After a 45-minute drive, we arrived 7:40am and doors opene at 8:00am. Luckily, the line was pretty short compared to Friday’s reports (two hour long waits!). We were waiting for only 10 minutes after the doors opened (maybe 100 people ahead of us). Once we were in, I headed straight to the racks of crop pants and “Swiftly” tees. Most of my friends were done browsing in 1.5 hours, but I took two hours because I was having a hard time narrowing down my choices. 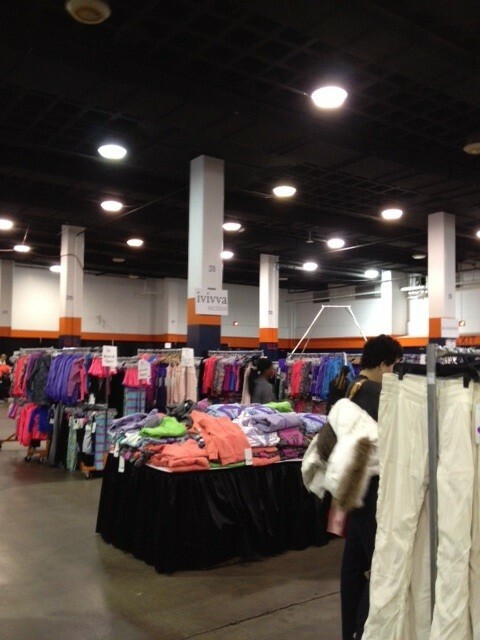 The space (Nassau Coliseum) was huge, there were fitting rooms, and there was a huge selection for women in most sizes. The men’s section was pretty small. Some of the prices (as of 8am Saturday) were pretty decent– $29 for a pair of shorts (normally $62), $69 for jackets, $4 for undies. – at 9:30am they started giving out free bikini tops (normally $58) and one-pc bathing suits with every purchase! -Three hours after we left they dramatically slashed prices—when we arrived everything was below $99, at 12Pm everything was below $55, and they had 4 men’s items for $100! Bummer, oh well. -the pricing was really confusing at the register—you couldn’t see what they were typing in and you had to check your receipt to make sure they didn’t over charge. I had to check it like 3 times. In the end, I got a good haul of 10 items (including smaller things like a yoga mat bag and undies) and I had fun. The sale was overwhelming at times. I would go back if the sale returns to the area, but I wouldn’t fly in for it (like the girls in this article)! My friends were also very patient and we all got good stuff. 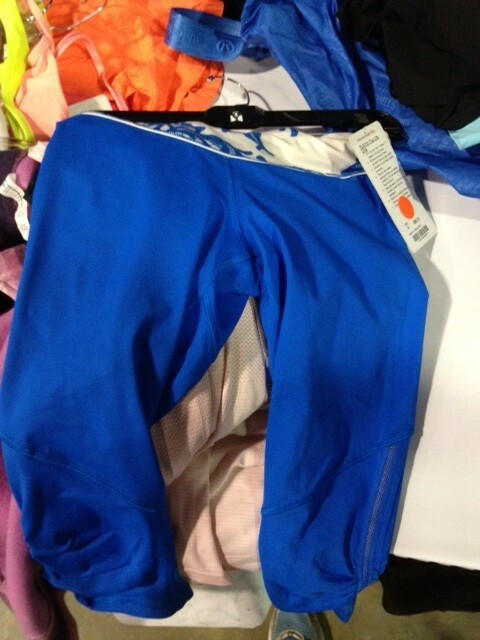 I like Lululemon because their designs are awesome, and their stuff lasts. I run a lot of races in the products and nothing has fallen apart yet! After all that shopping, we were hungry, so we rushed back to Brooklyn around 11:00am for brunch. We had some vegetarians in the group, so we went to an awesome vegan spot named Maimonides of Brooklyn (M.O.B.). 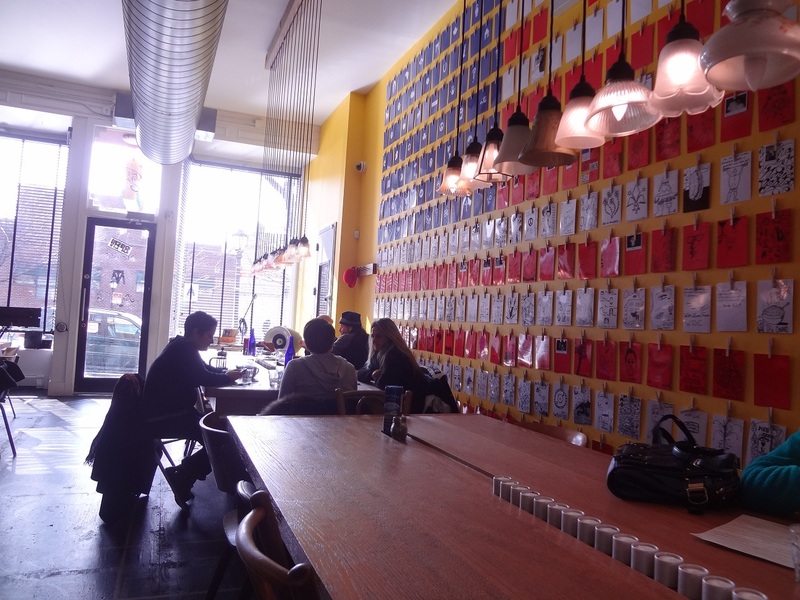 The space was bright and airy, the food was fantastic, and the menu was interesting. 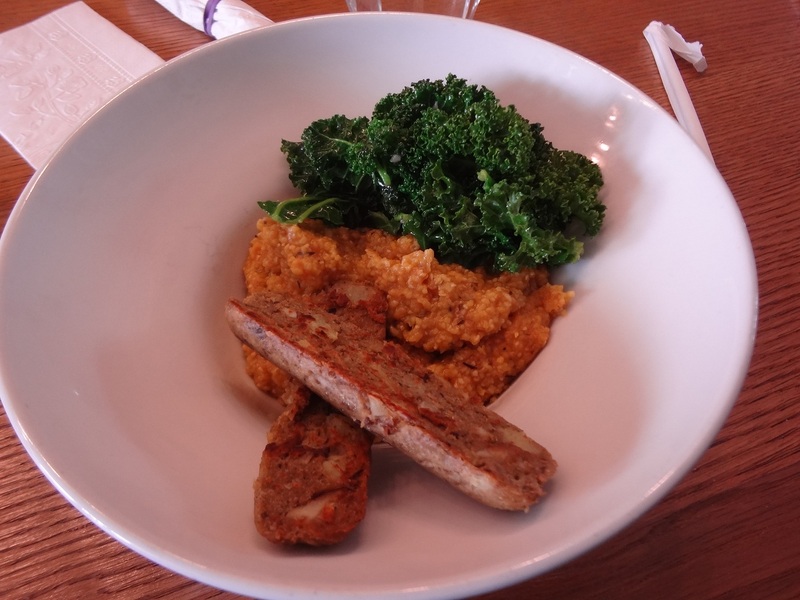 I ordered the spicy grits with kale and vegan sausage, and it was great! I will definitely be back. They even have La Colombe coffee! Maimonides of Brooklyn, a vegan restaurant/cafe. 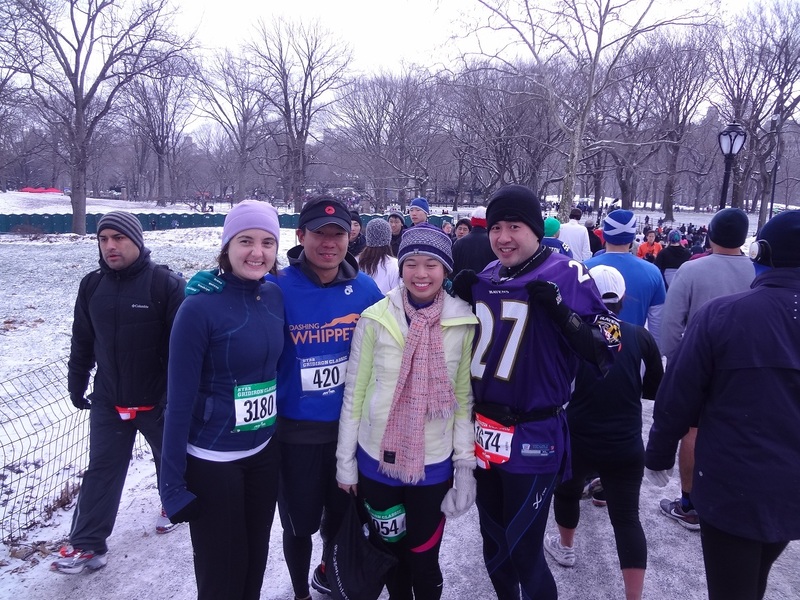 After all that pre-Super Bowl shopping excitement, I was ready to run the Gridiron Classic! This was a cold, wet race for me. I wore my thin New Balance sneakers, and unfortunately they are so thin that any moisture from the ground seeps up through the sole! My feet were cold and wet by walking through a rain-soaked Central Park before the race even started. I saw Kino in his Baltimore Ravens jersey, and a group of my Dashing Whippets teammates. There were a ton of people, since the race was sold out. I was wearing purple because I was cheering for the Baltimore Ravens. Go Ravens!! I felt pretty good the entire race–although it was cold, it wasn’t as cold as the previous weekend so I wanted to make the most of the weather. I finished in a time of 33:22, or 8:21 min/mile pace. I was pretty happy! I also had to save my legs for the Empire State Building Run-Up taking place only three days later on 2/6. 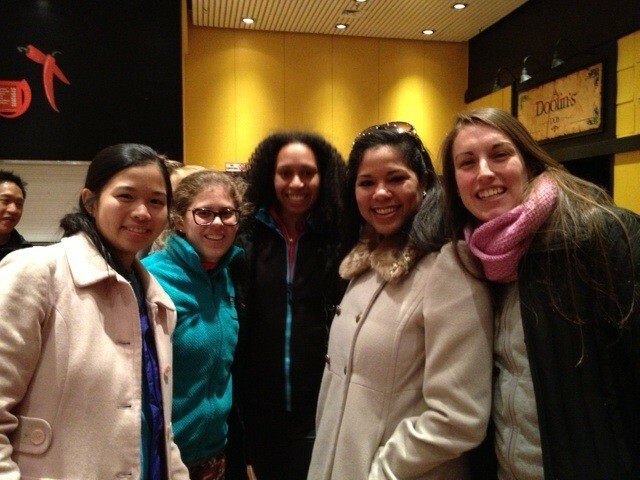 It was nice seeing my running friends, as always. I’m closing my eyes here. Must be tired. Ran into my friend Eric at the finish line! After the race, I had lunch with my friends Suzanne and Celia at Forcella in Brooklyn. They specialize in amazing fried margherita pizza. 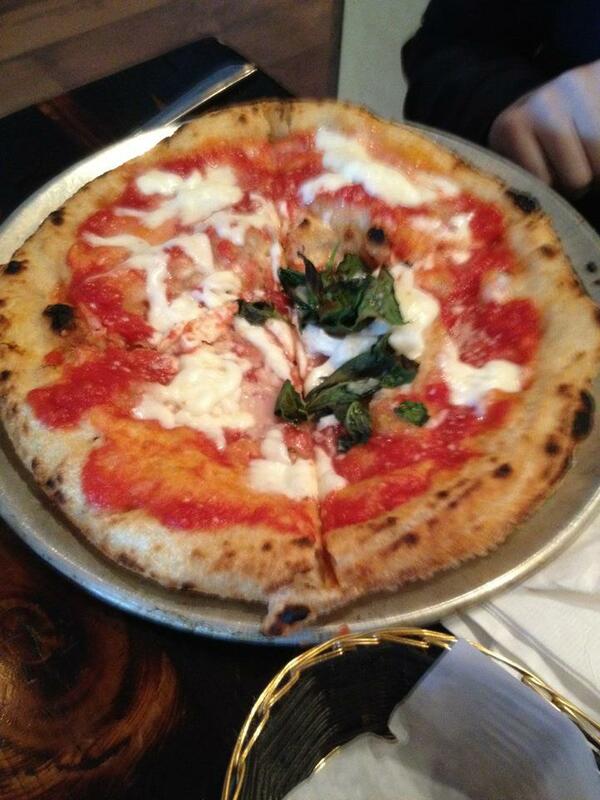 The crust is fried, then it’s baked in a brick oven. It was delicious. Thanks Suzanne for the invite! I was then off to Alex T’s place for a Super Bowl viewing party. I’m glad I ran a race the day of, since I indulged in wings, chips, guacamole, and all that good stuff that completes a Super Bowl party. Ravens won, yes!! 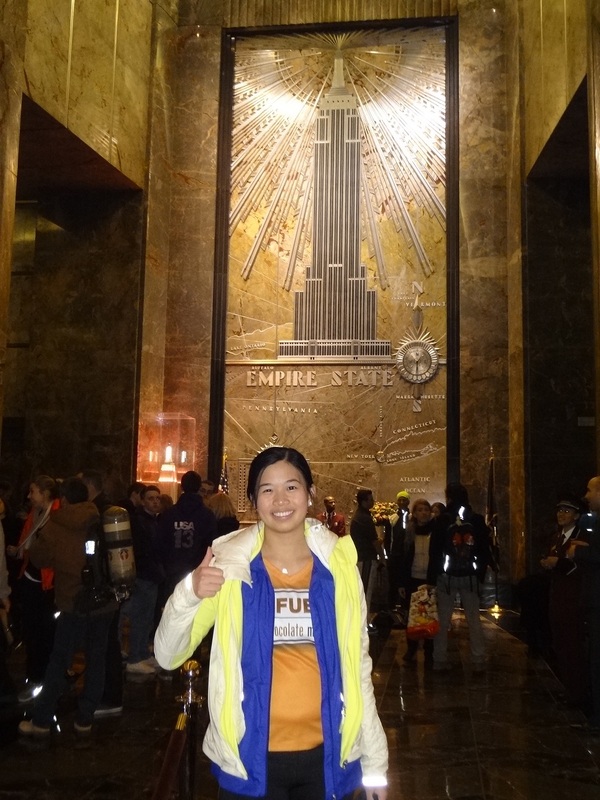 The Empire State Building Run-up is a very special race. Where else can you run up 86 stories (1,576 steps) to a gorgeous nighttime view of New York City? I had been trying to get in for the past two years but didn’t get in through lottery, and then finally I made it in! The field is limited to about 730 people, and this year over 1,900 people applied. I felt very lucky to be toeing the starting line. Some media celebrities like Natalie Morales and Kelly Ripa were running too! I had met both of them in previous events (Natalie at the 20in24 Back on My Feet race in 2011, and Kelly at an off-Broadway play), and it was cool to be facing the same challenge as them. Kelly Ripa was fundraising for Team for Kids (a cause near and dear to my heart, providing running programs for needy kids), and Natalie was fundraising for MMRF (Multiple Myeloma Research Foundation), so my hats off to them! Going into it, I knew not to underestimate these stairs. I had prepped as well as I could, practicing on stairs in my office building ( 3 x 11 floors), climbing the Haiku Stairs, using the Stairmaster at the gym for 20 minutes at a time, and keeping up my running. I pretended that my running background gave me little to no advantage, and that was actually the right way to approach it. I was pretty nervous, staring up at the skyscraper and knowing that I would be running up the belly of the beast at 8:00pm after a long workday. My friends provided encouraging posts on my Facebook page and through email, so I’m thankful for those! My friend Kenneth said “King Kong has nothing on you!” Knowing that, I couldn’t possibly fail! Categories: Uncategorized | Tags: Empire State Building Run Up, ESBRU, Forcella, GCT 100, Grand Central Centennial, Gridiron Classic 4-miler, grits, KellyRunUp, Lululemon Warehouse sale, Luon, Maimonide's of Brooklyn, Manhattan Half, Nassau Coliseum, vegan, Yogabowl | Permalink.